A son of a Celtic legend has risen to the Presidency of the Belfast Celtic Society. Charlie Tully Junior has become new Honorary President of the Society, replacing the recently deceased Jimmy Jones, a legendary striker for the team in the 1940’s. 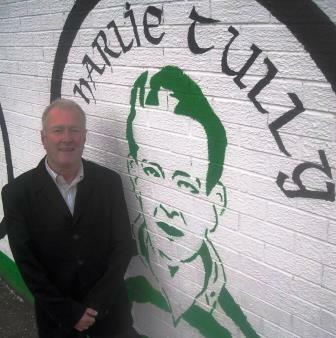 Charlie, son of the Belfast and Glasgow Celtic legend whose name he carries with pride, accepted the nomination for the Presidency of the Society on April 16, 2014, shortly before an event to mark the culmination of the Road to Paradise Outreach Programme, which helped spread the Celtic Story to audiences in communities beyond west Belfast. Since 2009, Charlie has been Society Vice-President, deputising for Jimmy Jones at a plethora of events and engagements and being the very public face for Society activities. 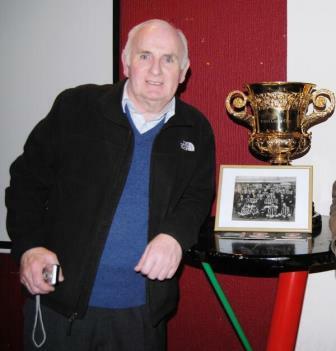 Jimmy Jones had served as President since the Society’s inception in 2003 and had always been a popular figure at events to mark the history of the Grand Old Team. Badly injured at the ‘Windsor Riot’ of December 27, 1948, the near-deadly event that sent Belfast Celtic hurtling out of football. Jimmy would often roll up his trouser leg in front of packed houses to show the enraptured audiences his wounded knee as he regaled them with his version of those sad events 65 years ago. Chairman of the Belfast Celtic Society, Padraig Coyle, said; “It is an honour for us to work with such sterling men like Charlie Tully Junior and Jimmy Jones. Jimmy was an incredibly well-liked person in the ranks of the Celtic support and had given his time graciously to us over the last decade, despite his advancing years. Since deputising to Jimmy five years ago, Charile Tully Junior has enjoyed similar status among all those who have met him, either at specially organised events or at our museum in the Park Centre in Belfast. It is a privilege to have him lead us deeper into our second decade of operation and we are sure he will remain just as popular, particularly given his father’s connections in Scotland. Indeed, just recently, Charlie was a guest of Celtic in Glasgow and was given the royal treatment at Lennoxtown, where he and son Paul were greeted warmly by manager Neil Lennon, who, like Jimmy Jones, is a Lurgan man. It is also very fitting that the vacancy for Charlie’s Vice-Presidency has also been filled by another Belfast Celtic stalwart, Davy McKavanagh, who already sits on our committee and is one of our most active volunteers. Davy’s brother Bill has long been regarded as the unofficial Belfast Celtic historian and his brilliant historical slide-show on the history of the club, produced in the 1980’s, has captivated audiences across Ireland when it has been shown. Davy’s father was an ardent Belfast Celtic fan, going back to the early 1900’s and he raised his sons in a similar vein. As a young boy, Davy remembers seeing the team play at Belfast Celtic Park on the Donegall Road in Belfast in their final year in soccer. We are thrilled he accepted the invitation to become Society Vice President and we’re sure he will be a popular choice among the membership." You can follow the Belfast Celtic Society and Belfast’s Grand Old Team on Facebook and Twitter @CelticBelfast.